An intriguing AI-robot-human interaction happened at The Royal Society Summer Science Exhibition this year. It may be an indication of the future: not just humans interacting with computers but humans, robots and Artificial Intelligences using computers to interact with each other. 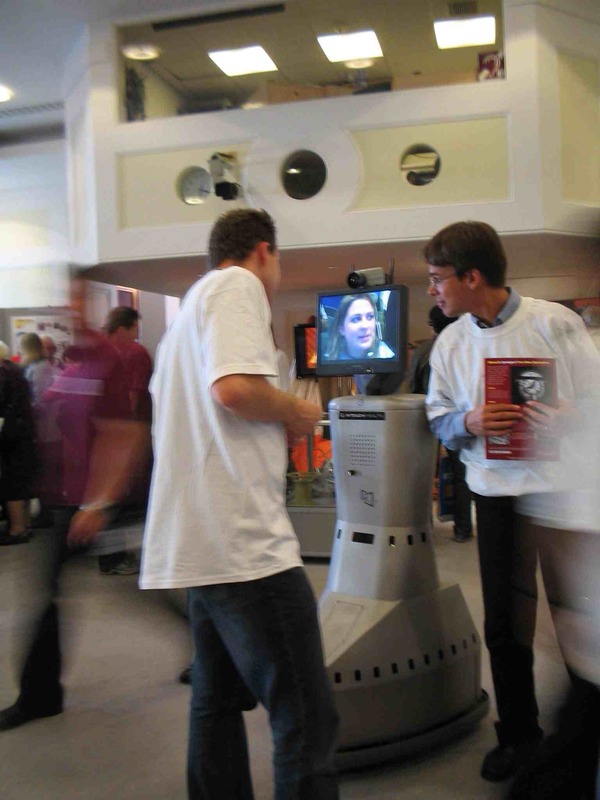 Jose Natalini, a computer scientist at the Universidad Nacional del Sur, took over control of a remote presence robot located at the Royal Society in London from his office in Argentina. He guided the Da Vinci robot, a part of the Imperial College stand on surgical robots, to the Queen Mary, University of London Sodarace stall about Artificial Intelligence. Once there he had his caricature drawn remotely by an Artificial Intelligence cartoonist program. It was developed by a team of undergraduates at Queen Mary and is based on Soda's Sodaconstructor software. As with a human cartoonist, the AI identifies out-of-the-ordinary features of a person's face, like the big ears of Dr Who, and exaggerates them ... In this case the AI did its sketching from the screen of the robot that was displaying its controller Jose's face. This interaction must be a world's first in human-computer interactive art: an AI sketching a cartoon of a person remotely using a robot telepresence! We are cleverer than we make out...dumb humans!